Almost a year ago, the Saints were rolling along, on a 13 game win streak and Dallas was coming to town, for a nationally televised Saturday Night Special. The home team could do no wrong, it seemed, winning some games it shouldn’t have, aided by opponents’ missing field goals and other fortuitous bounces of an irregularly shaped – crystal ball. It wasn’t so much how, but that the Saints were definitely hitting on all cylinders, and many fans boldly began making a travel itinerary for the Super Bowl. Even if they were premature, the plans were justified by faith. This season, over in the AFC, some of these types of phenomena have been occurring with the New York Jets. In the NFL these days, some luck accompanies good. During the week, Who Was America’s Team (?) was the talk of the towns and the media, everywhere. Dallas had its backs to the wall and responded by executing like the favorites, as the Saints looked a bit morose in their all black uniforms, and the streak was over, though at what turned out to be a lucky number. Memorably, right after they lost, the Times Picayune reported that several Saints players had sundry, celebrity oriented parties planned around the city for after the game. Scoop! 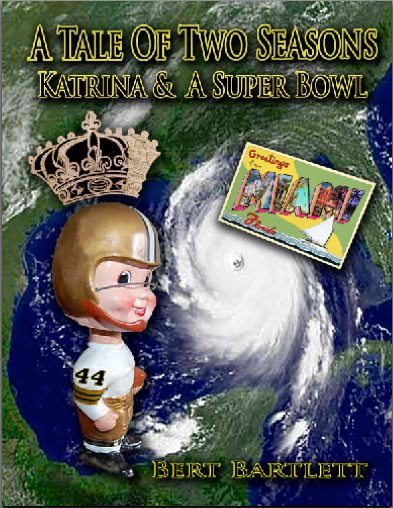 In the book A Tale of Two Seasons, Katrina & A Super Bowl, the title of the chapter about this time last season was, Premature Celebrations. Dallas held onto its “proprietary domesticity”, and the Saints subsequently made their own reverberations, all the way to the Vatican. How times can change. Great Expectations accompanied not the defending champs, but the ‘Boys over in Texas, the forecast no doubt clouded by that this year’s Big Game would be held in 2011 in Dallas, in owner Jerry Jones’ swanky new stadium. This was going to be a megalopolis, goes around comes around, star laden story, too large for a ten gallon hat, one that many sportswriters were drooling to type. Whereupon the Cowboys promptly lost 7 of their first 8 games, and quit like pigs. In the process, they rolled over in the mud too, precipitating the firing of head coach Wade Phillips. Ivy League educated and heir apparent Jason Garret, rumor has it, lobbied the owner’s ear, not complimentary to Phillips, and landed the top job on the sidelines. Rarely does a coaching change in Dallas not involve some Greek tragedy. Jerry Jones could ill afford to have thousands and thousands of eggs cleaned up off the plush seats, or stand idly by and have his palace turned into a dusty circus, or freak show. The Cowboys treated the new leadership like a fresh start and have won two straight. On Fox, Terry Bradshaw was heard to intimate they could go unbeaten to finish 9-7, and still go to the Super Bowl. Whatever he may have been drinking, I want to try some of it over the holidays. Meanwhile, the Saints have been obscured in the headlines in most places except New Orleans, and have been forging out blue collar wins that would make any union proud, with numerous stand-ins on call, having the backs of hobbled starters. Only John Lennon could Imagine what they might be if the likes of Reggie Bush, Pierre Thomas, Jeremy Shockey, Jabari Greer, Tracey Porter, Darren Sharper, and Malcolm Jenkins have not been playing musical chairs with miscellaneous hurts. Or if they just made a certain field goal in overtime against Atlanta. Considering these Saints have had natural post championship complacency, have been bulls-eye targets by opponents, on top of the Red Cross to deal with, overall, this may be as good a job as Sean Payton and his coaching staff have done since he got here in ’06. Unlike last year, the Saints are not parties to divine intervention services, but are merely punching the clock regularly, especially on defense, and getting to be a pretty good outfit “as is”, which is why we are steering away from anticipating who might or might not be playing each week. It is Thanksgiving, and fittingly, Saints fans should be grateful, for what they have, which is a good team right in the thick of things at 7-3, and plenty of roller coaster rides left – in an upward direction. Dallas has lots of playmakers too, and Miles Austin, who burned the Saints last season, has blossomed into a premier receiver. Rookie Dez Bryant has the Cowboys wowing, like they did for Hall of Famer Michael Irvin, and the former great possession receiver Drew Pearson, all in the same 88 numbered jersey. The biggest changeup for them in personnel is having journeyman Jon Kitna replace the out-for-the-year Tony Romo, and Kitna has been rounding into productive veteran form. The Stones of The Saints offensive line will be hard pressed to keep DeMarcus Ware, et al, off of Drew Brees, which was a problem last time they met. Bradie James from LSU plays linebacker effectively. Still, when you add it all up, the Cowboys have lost 7 games, and this won’t be the Detroit Lions waiting for them in the oven. Perhaps too optimistically, this smells like it could be All Saints Day on Thursday evening, with the offense “of old” carving up the Cowboys like turkeys, knocking the stuffing out of Kitna, not needing the beak of a field goal to win, and doing so going away, as if with wings, firmly reminding both teams – and everybody else – just who they are this season. This is, a little bit sentimentally, the first beaming in of the Saints to living rooms across this country on this holiday in the 44 year history of the franchise, and there’s no reason to believe – that gold won’t outshine silver at the dinner table. Well said Bert. As always, you encapsulate much of the experience, while illuminating ideas not necessarily obvious. Bottom line for me continues: These are the golden years of our franchise. We, more than anyone, know how infrequent they can be. Come Thursday let’s put turn them into hampered wranglers, serving them a large dose of medicine as we transform them into drugstore cowboys. Who Dat! Ya Ya ! I love Drugstore Cowboys ! LOL. I am almost too confident about this game ! But I feel like I have seen this type of scenario before, a dead fish on the dock, masquerading as a contender…..Go Saints! Lite It Up Boys ! And yes, you are correct, these are the Golden Years and we need to appreciate them.